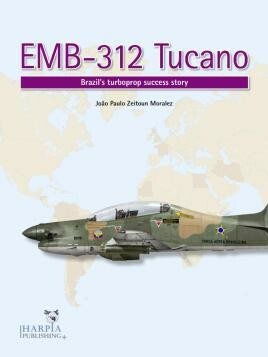 Harpia Publishing is proud to announce the launch of a new title for 2017, EMB-312 Tucano: Brazil's turboprop success story, set to become the definitive English-language reference work on this revolutionary Latin American aerospace product. Written by an expert in the field, this book recounts the story of Embraer's EMB-312 turboprop trainer, the first aircraft in its class to offer a cockpit and controls equivalent to its fighter contemporaries, as well enough power to match the high-speed manoeuvres of comparable jet trainers. Cheap to fly, capable of operating from unprepared runways and with limited maintenance requirements, the Tucano was Embraer's first design to be built under license outside Brazil, and more than 660 units were produced for service in 16 countries, seven of which have taken it into combat. Although it is best known as a trainer, this remarkable aircraft has also provided front-line air defence in countries including Paraguay and Honduras. After almost 30 years of service, it remains in widespread use today. This lavishly illustrated story of the first-generation Tucano includes accounts of Embraer's path to global success, service of the EMB-312 in its native Brazil, including with the air force's display team, licence production for the Royal Air Force and for export as the Shorts Tucano, and a detailed breakdown of every worldwide operator, past and present. Also included is the story of how the EMB-312 began its evolution towards the EMB-314 Super Tucano, which Harpia will cover in a separate book at a future date. Appendices, in typically thorough Harpia style, include a six-view drawing and a full inventory of EMB-312 units and insignia. With the level of accuracy and insight familiar to Harpia's regular readers, this unique aircraft profile also includes specifications, and details of training syllabuses, upgrades, avionics and weapons. Modellers will find this publication valuable in the extreme for any Tucano build project, and personal accounts breathe extra life into what is an already fascinating, but previously ignored subject. Highly recommended.